Many candlestick traders don’t fully realize that every candlestick tells a story about the market. That is certainly the case with the often overlooked high wave signal. In this addition to my free price action trading course, I’m going to show you how you should be trading the high wave candlestick pattern. This candlestick formation, like the spinning top and doji formations, shows indecision in the market; therefore, you wouldn’t take the high wave candlestick as an entry signal, but it can be a good indicator that the market may be changing direction. You often find multiple high wave candlesticks at the top or bottom of trends that are changing direction. Note: I have not found pure naked candlestick trading to be profitable in my own personal experience, although I know of traders that do well with these techniques. I have, however, found that using candlestick signals with a reliable trading system, that has proven to be profitable on its own, can be a powerful combination. What is a High Wave Candlestick Pattern? As I mentioned earlier, the high wave candle is similar to a spinning top or doji – as it signals indecision. The idea is that, over the course of the given time period, the bulls and the bears both tried to move the market, but neither was able to hold onto their gains by the end of the period. 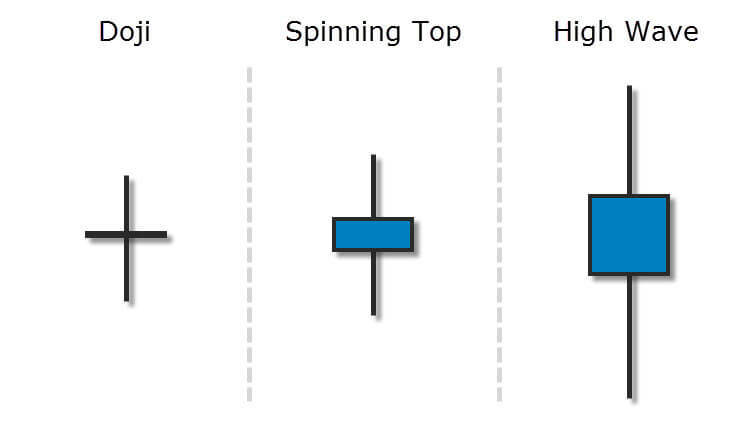 Like a spinning top, a high wave candlestick pattern has a relatively small real body. The difference is that a spinning top has relatively small upper and lower wicks, whereas a high wave candlestick has relatively long upper and lower wicks, revealing more volatility. In the image above, you can see a doji, a spinning top, and a high wave candlestick. Spinning tops and high wave candlesticks can have either bullish or bearish real bodies. The real body of a high wave can be larger than the real body of a spinning top, but should be relatively small when compared to its total range (the distance between its high and low). You may see high wave Japanese candlesticks forming in various places on your charts – including consolidating (low-range, sideways) markets. In order to be of any use, like the doji and spinning top, the high wave signal must come after an uptrend or a downtrend. Used in this way, it could signal a possible change in direction. At the very least, it should alert you to the possibility of stronger, more reliable, reversal signals upcoming. In the image below, you will see a series of high wave candlestick patterns. The first occurred after a small retrace in the overall trend, which is not typically where this signal would be useful. However, as you can see, its occurrence after a relatively large bearish candle signaled indecision in the market. It was followed by an inverted hammer (which is a weak bullish signal), and then the trend continued upward. The second occurrence, in the image above, is a more useful example of trading the high wave candlestick pattern. It appeared after an extended uptrend, signalling that the market was unsure about continuing the uptrend. That signal was followed by a bearish engulfing candlestick that engulfed the previous 2 candlesticks. The trend reversed from that point. The third high wave signal appeared shortly after the previous bearish engulfing pattern. This signaled more indecision, but ultimately the trend continued its reversal. Notice: At the top of the trend above, we have a high wave candle, followed by an engulfing candle, followed by a spinning top (or a formation very similar to one), followed by another high wave candle, followed by a doji, and then finally another engulfing pattern, before continuing the bearish reversal of the trend. All of these candlesticks are telling a story. The last high wave candlestick in the image above came after a downtrend, signalling indecision. It was followed by an engulfing candlestick, forming a bullish engulfing pattern (although not a very good one). The result was another reversal (at least in the short-term). Example #1: You’re watching an uptrend, waiting for a reversal signal. You see a high wave candle. This lets you know that there is indecision in the market, and you should be on the lookout for an upcoming strong reversal signal, e.g., shooting star, bearish engulfing pattern, evening star, etc…. The high wave candle also strengthens the idea that price will reverse in the area of your strong reversal signal. Example #2: You’re in a existing trade. You’re near your take profit. The market seems to have lost its momentum, and then you see a high wave candlestick form. You notice that this stall in price is also happening near a significant support/resistance zone. You decide to close your trade, keeping your profits, rather than risking a sharp reversal; or perhaps you just move your stop loss to break even. Exmaple #3: You decide to scale into a trade, starting with a small position. At first, price action is going your way, but then you notice a series of indecision signals, e.g., high wave candles, spinning tops, dojis, etc…. You decide to hold off adding to your position until the market shows you more evidence that it will continue in the direction of your trade. As I always say, candlestick trading is great for predicting short-term changes in market direction; however, nothing works 100% of the time in trading, and even strong reversal signals that work out can’t guarantee that the reversal will continue in your favor. That being said, you shouldn’t be trading the high wave candlestick pattern as an entry signal, but it can add to the case for taking a strong reversal signal. You often see multiple high wave signals at the absolute tops and bottoms of large trends, which can be powerful with the right trading system. Like all the other candlestick signals that we have discussed in my price action course, the context in which these signals occur is very important. If you see a high wave candlestick during a period of price consolidation, it’s obviously signalling market indecision, but so is the low-volatility, consolidating market. However, these signals can be valuable when they occur during trends, especially strong or extended trends. Steve Nison recommends using candlestick signals with western technical indicators to find and qualify the best trades. I like to combine candlestick signals with another profitable trading system that works well with candlesticks, like the Infinite Prosperity system. The high wave candlestick is a simple indecision signal – not powerful on its own, but it can help to make a strong case for taking other, stronger candlestick signals. 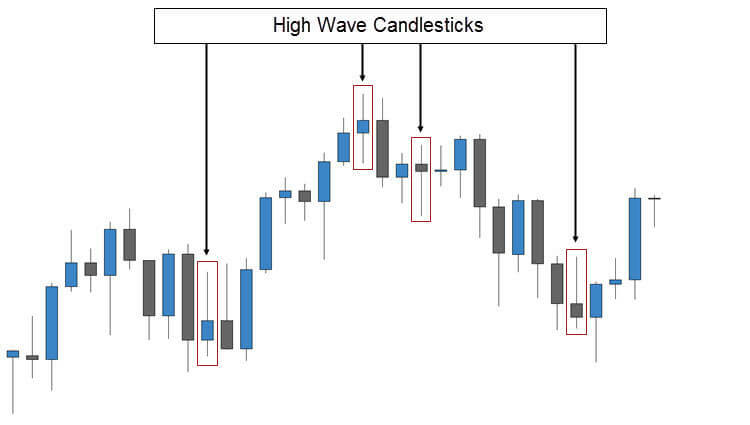 Hopefully, this article will help you get started trading the high wave candlestick pattern. Excellent article regarding high wave candlesticks. I will certainty lookout for it in my next trading session. That was well explained,glad i kept looking for an explanation which is simple yet at the same time powerful.I also loved how you stressed on looking at the bigger picture and consider every candle on the chart. Greetings,love & respect from India,Chris. Thanks for reading, Vijay. I’m glad you found this post useful. This is a great article; thank you! I have heard different explanations of an engulfing candle. The one that I normally look for is when the engulfing candle completely over shadows the entire candle, including the wicks. It doesn’t look like thats how you see them. Can you explain your definition? Thanks for the kind words, Robin. My definition of an engulfing candle is the real, traditional Japanese definition. There are some traders that define engulfing candlesticks the way you described them, like Walter Peters, and a few others that I won’t mention. Walter calls it a “big shadow” pattern, though. So technically, he is not calling it an engulfing pattern. It’s just that the shadows (or wicks, traditionally) completely engulfs the shadows of the previous candle. That isn’t the traditional definition of an engulfing pattern, although it’s generally considered to be a more powerful pattern if the shadows are also engulfing. Traditionally, when we’re talking about an engulfing pattern, we’re talking about real bodies engulfing real bodies. I updated my article on the bearish engulfing pattern last year. It’s one of the most thorough candlestick trading articles that I’ve written on this site. I plan to redo my entire price action course the same way when I get the time. I encourage you to have a look at it for a clear explanation of what mean by an engulfing candle and also to get some insight on how I actually trade these patterns.